Ace Blog: Are You Baking Your Own Christmas Cake This Year? You can make Mary Berry's sherry-infused, Victorian-style Christmas cake well ahead of the big day - in fact, the longer you leave it, the better it will taste! 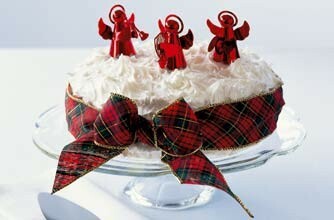 But the recommendation is to make it at least three weeks prior to Christmas, for if eaten too early it's crumbly. Prepare the fruit and soak in sherry 3 days ahead - this is essential to plump up and flavour the fruit. Make the cake and wrap as in stage 4. Store in a cool place for up to 3 months, following stage 4. You could also freeze the cake before decorating, for up to 3 months; defrost at room temperature. Good to Know: If you don't want to use alcohol, use the same quantity of orange juice. Instead of covering with icing, you could brush warmed apricot jam over the cake, then arrange glace fruits and nuts on top. If you're going to try your hand at baking, don't forget your bakeware! We've got all the equipment you need for the perfect results, including baking tins, measuring spoons, cake decorating kits and more! And if you want to make light work of any mixing, take a look at our range of Mixers. Mary Berry, The Autobiography and the Great Book of Baking are also available at 24ace, as is the Danilo Great British Bake Off Family Organiser 2015, which features easy to follow seasonal recipes for all the family.